The sound-video performance echo 10-9 takes place on the nano and microlevel. With a clear analog esthetic it demonstrates the formal characteristics of materials, which are transformed on the spot, creating ambient a/v landscapes. The development of the echo 10-9 project is based on research and experiments with with ferrofluids, oils and nanobots, which create their own choreography in relation to different micro- and macrofluids, nanomaterials and magnetic reaction fields, in unison with physical and chemical effects. 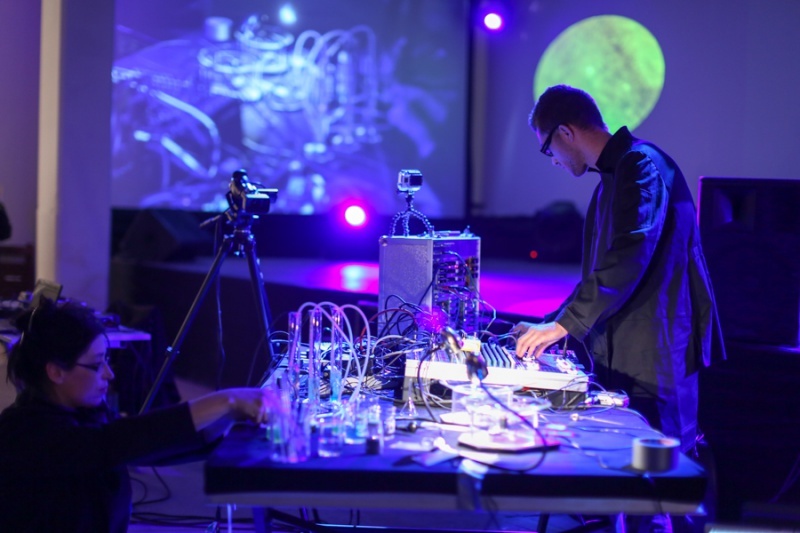 With their interventions, the authors stimulate the self-generated or autopoetic chemical reactions on multiple levels, influencing the sonic composition and choreography between the nanobots. The combination of physics, chemistry and computer vision creates an immersive environment and reveals invisible fields that create (auto)poetic effects with the sensory experience. By expanding the sensory specter the performance challenges the question of perception and arouses the idea of small-size worlds with different laws, co-existing on different levels – like an insight into a new dimension, or having the possibility to think the world differently. The project is supported by the Ministry of Culture of the Republic of Slovenia, the Municipality of Ljubljana and the Municipality of Maribor.